Contradictions in the Hadith #2: Selling gold for silver? Can we trade gold for silver? If we listen to the Prophet Muhammad we won’t know what to do. First, Momo tells us clearly that we must trade gold for gold, which kind of defeats the entire purpose of capitalism. But then he turns around and tells us that it’s ok to trade silver for gold. In fact, they don’t even have to be equal in weight, which is good for the precious metals brokers. Can you imagine getting paid for an ounce of gold with an ounce of silver? But which Hadith do we listen to? Muhammad made things pretty complicated for his followers. This entry was posted in Atheism and tagged Allah, Atheism, atheist, God, Hadith, Islam, Muhammad, Religion, The Prophet Muhammad, the Quran. Bookmark the permalink. 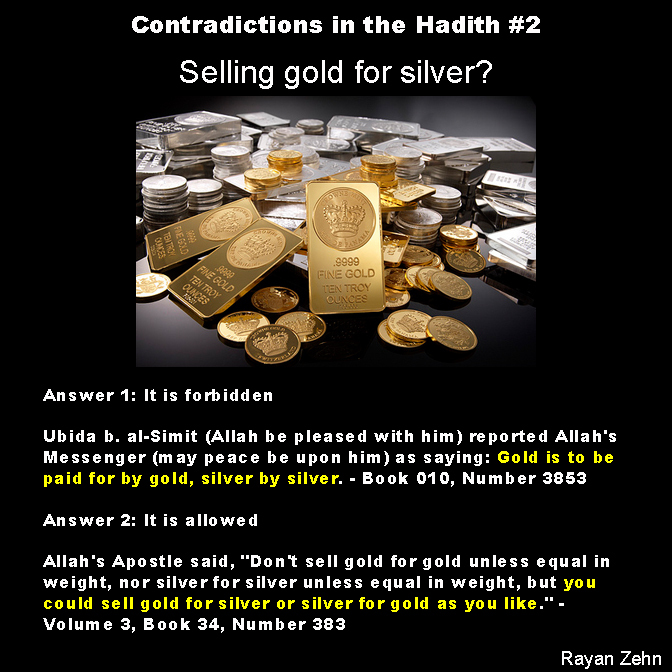 4 Responses to Contradictions in the Hadith #2: Selling gold for silver? The religious texts, as even the religious do, always speak from both sides of their mouth. The other day, a Christian friend had taken his family to church to try and win a prize for his son, and the prize was a cellphone. Well, they went everywhere in that city to find certain things to take pictures of, and when they had returned, they had been told by the clergy that this exercise was a lesson on how people should not concern themselves with earthly possessions, and my friend almost went through the roof. He told them that he didn’t have that kind of money to go on a wild goose chase for absolutely nothing, and has since quit the church. My only comment to him was: “perhaps money is not an object? Since the pastor is getting his money from the congregation it would seem that he has deeper pockets to pull such a stunt. He then revealed to me that that was his sentiments exactly. And further said that he lives far from the city, and to then go on a hunt like that when he didn’t really have the money to spare, didn’t really give a nice message to the children who’s families don’t have the capital for such nonsenseical hogwash.